Some researchers did a research on the impact of Buddhists words on individuals irrespective of the religious background these participating individuals have. Participants included – Western Christians, Westerners who practiced Buddhism and Taiwanese with a Buddhist/Taoist. According to that research, if people are exposed to Buddhists concepts people reacts to things positively more often. Why this research seems plausible to me has another story besides the story of Fish. My wife has not been very spiritual person. After our marriage in Dec, she had opted for leave. In this leave period she read about 1/3rd of the book Old Path White Clouds. When I used to comeback from office I started noticing that she is very calm and used to get into silence. Yes literally that was the case, it was obvious, no extra efforts required to notice it. Initially when I was worried about what went wrong she said nothing, and that bothered me even more. I asked her to go out for walk, meet people in our building, go to nearby Gurudwara and go to market just to get mingled. She was new to Mumbai so her being silent worried me further, whether she is nostalgic or not happy [both cases seemed improbable because of her demeanor]. Yet that worried me. Her silence had depth, I observed for a couple of days then I asked her what is the reason, and she showed me the book – she said I get into kind of meditation when I read this book page by page. I have become so calm and at peace! 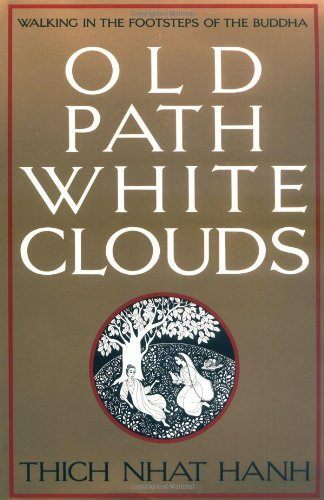 I first read Old path white cloud in 2007, since then it has become a treasure for me. I have donated this book to a couple of people. I am not a Buddhist, and in fact I somehow try to avoid getting attached to any -ISM (religion). The Stanford research has – time and again – proved to me [without that research itself, any reference of priming or social psychology] that there is something in the teachings of the Buddha that brings positive changes to an individual. Eating for the sake of eating? Is it just possible that she has discovered that silence is the best policy to follow when you are around? Poor Buddha. Why blame him? Marriage does funny things to people. It is not me, she said that and she only says that it was impact of the book…. Even before I could identify or understand it was her finding that whenever she reads the book she gets into silence. Uncleji she also wrote her opinion below. I must get my hands on that book. I’d say my husband would be delighted. I talk way too much for his taste and I notice he’s getting quieter and quieter these days. Maybe if I say nothing he will actually speak. Maria, do not have any expectations. Expectations reduce joy. Also, what effect you may have one cannot guarantee. Read that book just to read it. Perhaps dont read it if you are not interested in reading non fiction. The book is a life story of The Buddha narrated by Thich Nhat Hanh. It is a wonderful book though. It actually happened to me. Now a days I have started reading that book to complete the remaining chapters and I prefer to read it in the morning while commuting to my office. I have noticed that I feel very clam and in peace after reading just about 20 to 30 pages. I feel waves of peace every morning now a days. Readers – Simple is my wife, who has commented above. Thank you so much Simple for sharing your thoughts here. Forgive my late welcome to the LBC, Pravin. It’s sad that your wife did not tell you sooner why she was silent; it would have saved much pain and worry. Thank you so much for welcoming and blessing me Maxi. Yes indeed I was worried when I saw her silent, she is about 2000km away from home for the first time, she has lived with her parents all the time and here she does not know many people. Initially I felt she is nostalgic, however my fear turned out to be unfounded. Actually she was not sure what is happening to her, so she too could not suggest possible cause.